Kevin Michael Costner (born January 18, 1955) is an American actor, producer, and Academy Award-winning director. He has been nominated for three BAFTA (British Academy of Film and Television Arts) Awards, won two Oscars and a Golden Globe Award. His first leading role was the 1987 film The Untouchables, opposite Sean Connery, Robert De Niro, and Andy Garcia. Kevin Costner is well-known for his roles as Lt. John J. Dunbar in the film Dances with Wolves, Jim Garrison in JFK, and Ray Kinsella in Field of Dreams. Costner was born in Lynwood, California, the youngest of the three sons (the middle of whom died at birth) of Sharon Rae (nee Tedrick), a welfare worker, and William Costner, an electrician and later utilities executive. He has German, Irish and Cherokee ancestry (his Oklahoma-born paternal grandfather was half Cherokee). 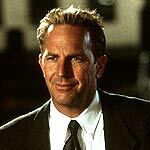 Costner was raised Baptist. He attended elementary school at McKevette School, in Santa Paula, California, Cabrillo Jr. High School and Buena High in Ventura, California. A poor student, Costner enjoyed sports in spite of his slight stature and took piano lessons, wrote poetry and sang in the First Baptist Choir. Spending his teenage years in various parts of California as his father's career progressed, Costner lived in Orange County, then in Visalia (Tulare County), attending Mt. Whitney High School, and graduated from Villa Park High School in Villa Park, California, in 1973. He went on to earn a B.A. in business from California State University, Fullerton, in 1978, where he was a member and President of the Delta Chi Fraternity and met bride-to-be Cindy Silva. Costner became interested in acting while in college, and on graduation married Cindy. The couple honeymooned in Puerto Vallarta and on the return plane journey had a chance encounter with actor and fellow passenger Richard Burton, who had purchased all the seats around him for solitude. Burton agreed to speak to Costner after he finished his book. Costner, who had been taking acting classes, but had not told his wife about his desire to be an actor, watched Burton closely and approached when Burton gestured him to. Costner told Burton that he would prefer that his life was not filled with the type of drama that had followed Burton and asked if he would have to tolerate that if he became an actor. Burton replied, "You have green eyes. I have green eyes. I think you'll be fine." After landing, Burton's limousine pulled up to the curb where Costner and Cindy were waiting for a taxi, where Burton wished Costner luck. Costner would never see Burton again, but credits Burton with partially contributing to his career. Having agreed to undertake a job as a marketing executive on return, Costner began taking acting lessons five nights a week, with the support of his wife. His marketing job lasted 30 days. He took work which allowed him to develop his acting skills via tuition, including working on fishing boats, as a truck driver, and giving tours of stars' Hollywood homes to support the couple while he also made the audition rounds. Costner made his film debut at age 19, in the 1974 film, Sizzle Beach, U.S.A., although the film was not released until 1986 after he became a star. Costner made a very brief cameo in the 1982 Ron Howard film "Night Shift", he is listed in the credits as 'Frat Boy #2' and appears at the climax of a Frat-style blow-out party in the N.Y.C. morgue, when the music is suddenly stopped by a frantic Henry Winkler, Costner can be seen holding a beer and looking surprised at the sudden halt of celebration. He appeared in a commercial for the Apple Lisa in 1983, and in the same year, had a small role in the nuclear holocaust film Testament. Later, he was cast in The Big Chill and filmed several scenes that were planned as flashbacks, but they never made it to the final cut. His role was that of Alex, the friend who committed suicide, the event that brings the rest of the cast together. All that is seen of him are his slashed wrists as the mortician dresses his corpse in the movie's opening scenes. Costner was a friend of director Lawrence Kasdan, who promised the actor a role in a future project. That became 1985's Silverado and a breakout role for Costner. He also starred that year in the smaller films Fandango and American Flyers. Full-blown movie star status for Costner arrived in 1987 when he starred as federal agent Eliot Ness in The Untouchables and in the leading role of the thriller No Way Out. He solidified his A-list status in the baseball-themed films Bull Durham and Field of Dreams. Costner's greatest success came with the epic Dances with Wolves (1990). He directed and starred in the film and served as one of its producers. The film was nominated for 12 Academy Awards and won seven, including two for him personally (Best Picture and Best Director). Revenge (1990), in which he starred along with Anthony Quinn and Madeleine Stowe, directed by Tony Scott (Costner had wanted to direct it himself), was another notable film from the same year. He followed this with Robin Hood: Prince Of Thieves (1991), the Oliver Stone-directed JFK (1991), The Bodyguard (1992) and Clint Eastwood's A Perfect World (1993), all of which provided huge box office or critical acclaim. Costner then starred in the golf comedy Tin Cup (1996) for Ron Shelton, who had previously directed him in "Bull Durham.". The actor developed the film Air Force One and was set to play the lead role of the President, but ultimately decided to concentrate on finishing The Postman instead. He personally offered the project to Harrison Ford. His career revived somewhat in 2000 with Thirteen Days, in which he portrayed a top adviser to John F. Kennedy. The western Open Range, which he directed and starred in, received critical acclaim in 2003, though it was only a minor success commercially. After that, Costner starred in The Guardian and in Mr. Brooks, in which he portrayed a serial killer. Costner was honored on September 6, 2006 when his hand and foot prints were set in concrete in front of Grauman's Chinese Theatre alongside those of other celebrated actors and entertainers. While in college, Costner was a member of Delta Chi fraternity. He started dating fellow student Cindy Silva in March 1975, and their subsequent marriage produced three children: Annie (born in 1984), Lily (born in 1986), and Joe (born in 1988). Kevin and Cindy divorced in 1994 after 16 years of marriage. He also has a son, Liam (born in 1996), with Bridget Rooney, with whom he had a brief relationship following his divorce. In 1996 he dated and lived with supermodel Elle MacPherson. On September 25, 2004, Costner married his girlfriend of four years, the German model and handbag designer Christine Baumgartner, at his ranch in Aspen, Colorado. Guests, including Oprah Winfrey, Oliver Stone, and Bruce Willis, were treated to activities including horseback riding and baseball during the weekend festivities. Costner took his new bride for a canoe ride on a lake following the ceremony. The couple honeymooned in Scotland. Their first child, Cayden Wyatt Costner, was born on May 6, 2007 at 10:30 p.m. at a Los Angeles hospital. He weighed 7 lbs, 14 oz. Several of Costner's films have included a baseball theme. They include Chasing Dreams, Bull Durham, Field of Dreams, For Love of the Game and The Upside of Anger, in which his character is a former pro baseball player. The actor plays regularly in celebrity golf tournaments, including the PGA Tour's annual pro-am at Pebble Beach, California and the BMW Pro-Am held each April in Greenville County, South Carolina. Costner owns 93.5% of the "Midnight Star" casino, in Deadwood, South Dakota. The casino, its sports bar, "Diamond Lil's," and its restaurant, "Jake's," are named after characters and locations from the movie Silverado and the facility contains posters, costumes, and other memorabilia from Costner's films. In July 2004, Costner fired Francis and Carla Caneva, who managed the Midnight Star. A judge subsequently ordered Costner to pay $6.1 million to buy out the Canevas as his business partners. In October 2006, Costner asked the South Dakota Supreme Court to re-examine the ruling, as an accountant hired by the actor had determined the market value of the casino to be $3.1 million. Costner is a fan of the London, England, football team Arsenal F.C. While filming Robin Hood: Prince of Thieves, he was given the opportunity to attend a game and has followed the team ever since. The actor was named ceremonial Grand Marshall of the Auto550 club for the February 25, 2007 NASCAR Nextel Cup auto race event at the California Speedway. He has a home in Austin, Texas and sometimes appears at University of Texas baseball practices and games. Costner is a close friend to Longhorns baseball coach Augie Garrido, from Garrido's days coaching at Cal State Fullerton, the actor's alma mater. He cast Garrido to play the role of "Yankee Manager" in his film For Love of the Game. He tries to attend every College World Series game that Cal State Fullerton plays in Omaha, Nebraska. He is also the singer of "Kevin Costner and Modern West," a rock/country band which he founded with the encouragement of his wife Christine. He began a worldwide tour with the band in October 2007, which included shows in Istanbul and Rome. Since 1992, Costner has financially supported a variety of Democratic Party politicians, including Al Gore and Tom Daschle, but also made contributions to Republican Phil Gramm as late as 1995. He said publicly in 2008 that he has no ambition to run for political office, adding "I've lived quite a colorful life." In the final days before the 2008 election, Costner campaigned for Barack Obama, visiting various places in Colorado - a state in which he has a home. In his speech, Costner stated the need for young voters to get to the polls, early and with enthusiasm. "We were going to change the world and we haven't," Costner said at a Colorado State University rally. "My generation didn't get it done, and we need you to help us."